Sweating (also called perspiration) is the release of a salty liquid from the body's sweat glands. Sweat is an important mechanism to protect body from overheating. Evaporation of the sweat from skin surface makes us cooler and helps the body maintain its temperature. Sweat comes out through sweat glands distributed all over our body. Human bodies have about two to four million sweat glands. How much you sweat depends on how many sweat glands you have. A person is born with about two to four million sweat glands. The glands start to become fully active during puberty. Women have more sweat glands then men, but men's glands are more active. Most of these glands are what are called “eccrine” sweat glands and are found in large numbers, primarily on the plams, the soles, the forehead and cheeks, and in the armpits. These glands secrete an odorless, clear fluid that helps the body to control its temperature by promoting heat loss through evaporation. In general, the type of sweat involved in hyperhidrosis is eccrine sweat. The other type of sweat gland is called an “apocrine” gland. Apocrine glands are found in the armpits and genital region. They produce a thick fluid. 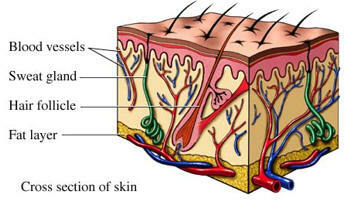 When this fluid comes in contact with bacteria on the skin’s surface, it produces a characteristic potent “body odor”. Why Some People Have Excessive Sweating? In people who have excessive sweating, or hyperhidrosis, the sweat glands (eccrine glands in particular) overreact to stimuli and are just generally overactive, producing more sweat than is necessary. It’s often said that people with hyperhidrosis have sweat glands that are stuck in the “on” position.